M.A.M.E. - Arcade Emulation - Do you remember the last time you saw an Asteroids coin-op arcade game? Or when did you last drop a quarter into a Defender machine and hear that cool analog start-up buzz it makes? Thought you never have the chance to experience the primitive coolness of the early games again? Check out this site and learn about arcade emulation on the PC and other platforms. Some really smart guys have designed programs that can read the ROM images taken from the original arcade boards, thus preserving these otherwise fading pieces of history. You'll soon be playing literally hundreds of the actual games from back in the days, boyeee! This site is updated regularly. A Story about Space Invaders - What can I say? We bought our first game - An original Space Invaders. Read all about it. Play Midway's Space Invaders II These are the roms for a Space Invaders II game which is different from the normal Deluxe version. The roms are A,B,E,F,G rather than D,E,F,G. The cool thing is, you can play head to head! I haven't tested these on a Normal Space Invaders Deluxe board to see if they work. But if you need the roms, just click on the link. The difference between the Midway Space Invaders Deluxe and the Space Invaders Part II is the small daughter card attached to the audio logic board. This game also has a built in Rom/Ram test (not just pulling out the H prom). For the manual, go here. Videotopia - A classic video game museum! www.ionpool.net - Lots of good tech information on restoring video games. Get your Roms here - Please remember that you're entitled to use these roms legally if you own the actual machine. - And definitely don't distribute these roms and the emulator together. Stella: Multi-platform Atari 2600 Emulator - This site has an emulator of the Atari 2600 (which brings back fond memories) and hundreds of the original games. Remember how much those cartridges cost back in the early eighties? Combat! Yar's Revenge! Pitfall! WOO-HAH!! 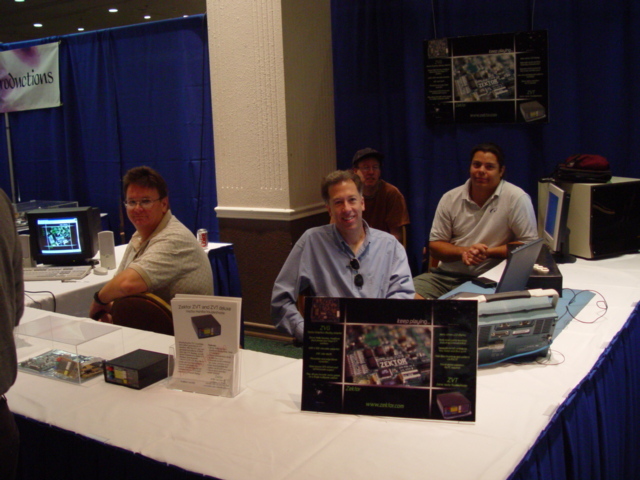 Official Intellivision Website - We never owned an Intellivision, but our friends Sean and Steve Sherman did. In fact, we recently learned of another honorable mention - Dan Robinson - who confessed to having had one as a youth. This site allows you to download an emulator for the game. Although only a few games are available for download, there will be a CD Rom available soon that will contain pretty much all of the Intellivision games. The History of Video Games Website - Everything you wanted to know about the home systems of yesteryear, including Odessey 2, Colecovision, Atari 5200, and such. Not sure about the graphic with Grover on the toilet though. Super Missile Attack -You may have heard of Missile Command, but you won't run across the enhanced version very often. Matt bought this game for $100 as a fixer upper, not realizing that there was a Super Missile Attack Board inside. He wound up getting a Free Star Castle just for the Board!" The Game Status Page - This page has a list of games that I'm currently working on and what types of things I'm doing to fix them. Hopefully it will be interesting reading for you. Randy Fromm's Technical Department - Very useful information on video game repair. Play a game of Missle Commando - Go ahead and play a free video game.